I know it’s the most basic thing ever, but fall is my favorite season. By a long shot. Don’t worry, I’m not dressed in Uggs with a Starbucks PSL in hand, wrapped in a giant plaid scarf while shopping for decorative glass pumpkins. I’m not THAT basic. But I AM darn close. Usually by the end of August, I’m over summer. I’m over the heat. The humidity. My tan starts to fade, and I don’t mind. I crave the crisp, cool air. I long to be able to step outside and not be bowled over by oppressive heat. I look forward to football Sundays (and all the food that comes along with that, of course). I anxiously anticipate all the leaves changing color. I long for honeycrisp apples. I can’t wait to wear cozy sweaters and to sip on hot coffee in the mornings. I eagerly await evenings in front of the fireplace and sleeping with the windows cracked. And yes, I might even crave a pumpkin spice coffee from Dunkin. See? I’m a touch basic. This season is just…the best. With it comes all of that magic, along with some pretty spectacular comfort food. Cozy food, as I like to call it. It’s the kind of food that warms you up, literally and figuratively speaking. And this soup is just that. Pure cozy comfort. In a bowl! I love roasted red pepper soups. They have such an amazing flavor, and when they are served creamy and smooth, I lose my mind. 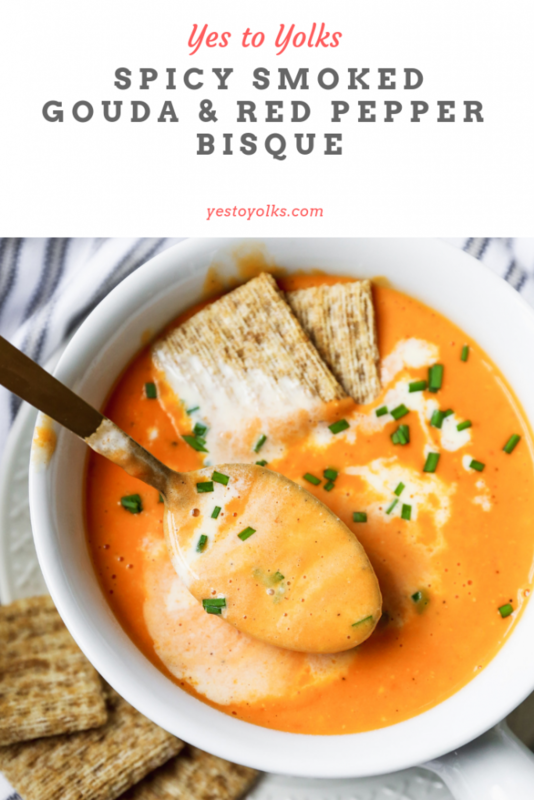 There’s something about a bisque or a creamy soup that makes me weak in the knees. And the flavor of roasted red peppers makes me swoon. They’re sweet, smoky, and still just as bright tasting as a fresh bell pepper. I love them. 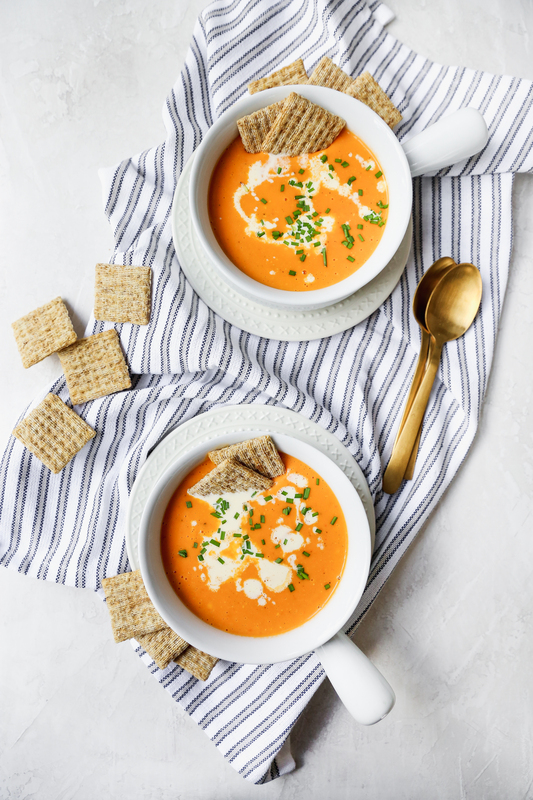 This soup is so loaded with tons of flavor and richness, it is hard to imagine such results can be accomplished in such a relatively short cooking time. That’s one thing I love about soup: once you learn the basic technique, you can apply it in a million different ways. Uncomplicated ways! 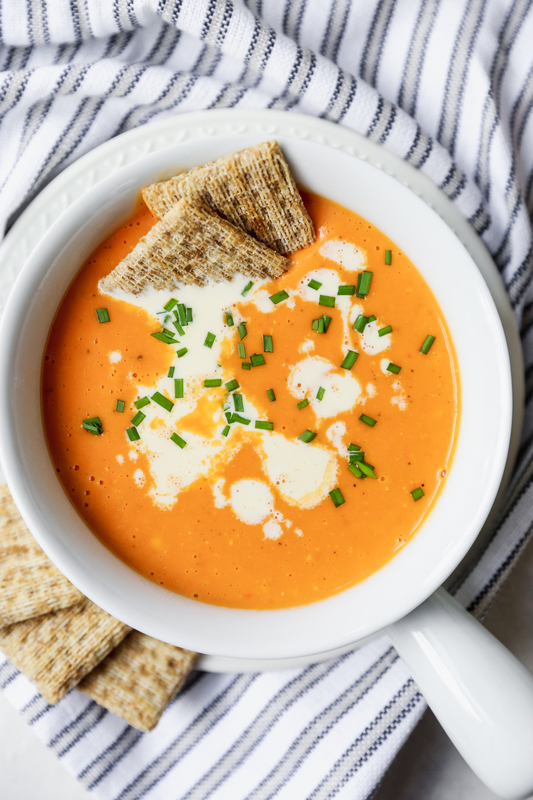 Soup is so much easier to make than a lot of people think. You saute a little veg until soft, add your liquids/spices/other flavorings, and let things simmer away for a bit. Depending on the soup, you’re ready to serve it, or it may require a blending step. Either way, soup is NOT hard to make. And it is the epitome of fall food, at least in my mind. 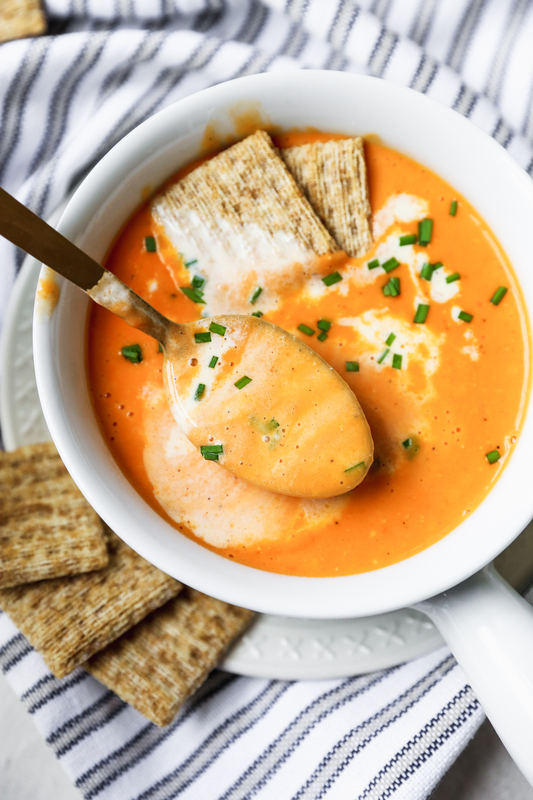 Not only is this one easily made vegetarian without sacrificing an ounce of flavor, but it’s also spicy, savory, a touch sweet, rich, creamy, and smoky! That last part is thanks to smoked gouda. Oh yes, that’s right. I put smoked gouda in our red pepper soup. Trust me. You’re gonna like it. It’s kind of amazing. 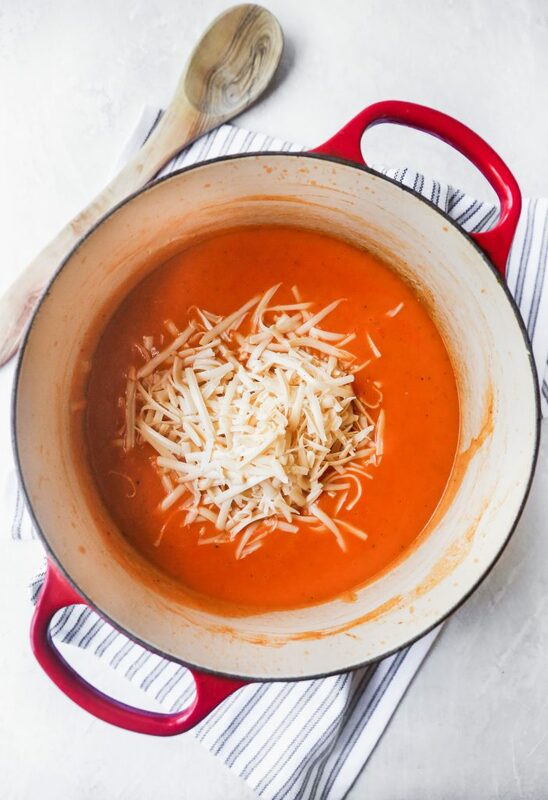 This soup is stellar without the cheese. Let me just state that as fact. It just is. It’s already creamy and rich and so, so tasty. But something truly magical happens when that cheese gets melted into it. And it certainly brings the cozy. Heat the oil and butter over medium heat in a large pot. Add the onion, carrot, and a generous pinch of salt and cook until tender, about 5 minutes. Add the garlic, red pepper flakes, and thyme sprigs and cook for another minute. Add the wine and cook, scraping up any brown bits on the bottom of the pot, until it is reduced by half. Add in the broth, season with more salt and pepper, and bring to a simmer. Once the soup is simmering, add the roasted red peppers and the diced potato. Simmer over medium-low heat, stirring occasionally, until the potato is very tender, about 20-25 minutes. Carefully blend the soup, in batches, until smooth, thick and creamy. Return the blended soup to the pot and place it over medium-low heat (alternatively, you can use an immersion blender and blend it up right in the pot). Stir in the cream and the smoked cheese, stirring constantly until the cheese is melted and everything is combined and creamy. Season, to taste, with salt and pepper. Serve! 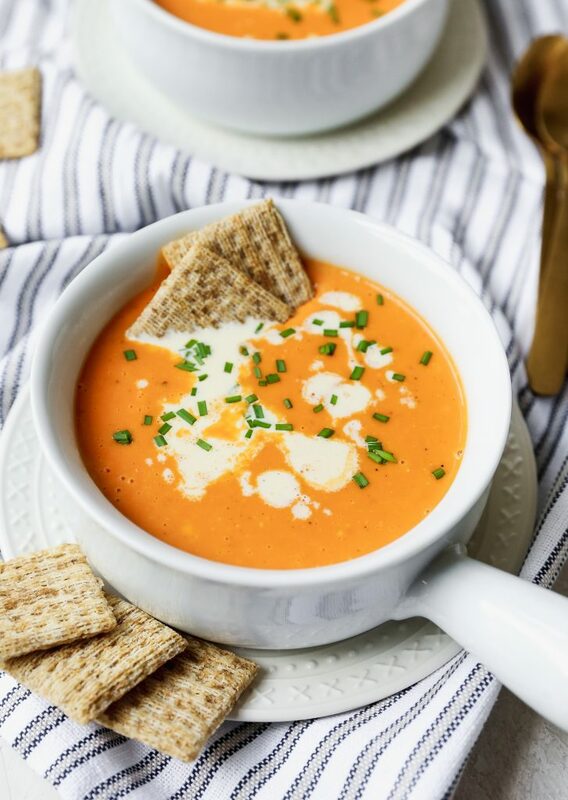 Based on my creamy roasted red pepper soup with fried lentils.